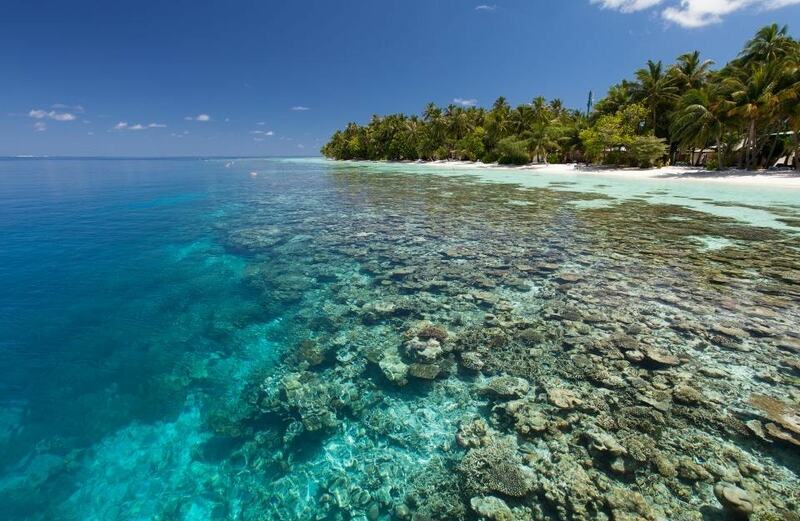 Embark a seaplane for a scenic flight over countless islands and colourful reefs. In 25 minutes you will reach Vilamendhoo Island Resort in South Ari Atoll. 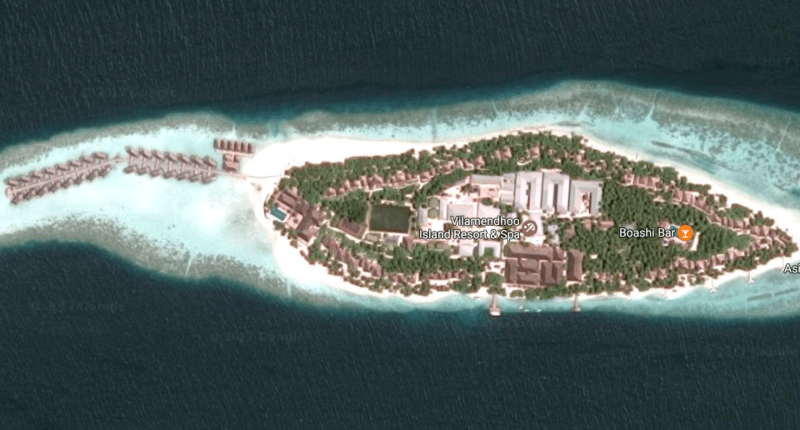 Measuring 900 metres in length, Vilamendhoo is long but narrow in shape. The island shape makes it possible to walk to the beach in few steps. Vilamendhoo has an amazing house reef. 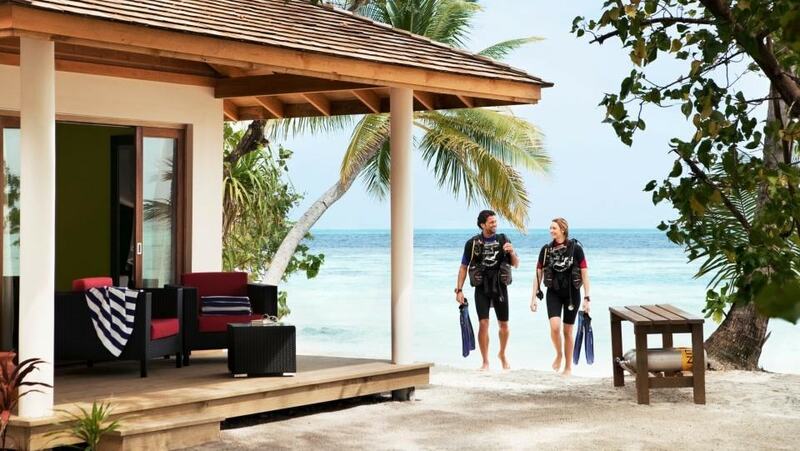 Scuba divers from other maldives resorts often visit Vilandhoo reef. The reef near arrival jetty is a popular dive site. The dive centre at Vilamdhoo is operated by Euro Divers. Apart from rich rouse reef there is a whale shark point close by which is at Dhigu Rah. Another popular dive point is the manta spot behind Lily Beach. There are 184 villas in the resort, 30 of them overwater and 154 on the island. There are 3 bars on the island; Sunset bar is located on the western beach side near water villas and comes with a pool, Bonthi is in the middle of island near reception area, Boashi is on the eastern side but not on the beach. There are lot of palm trees around Boashi and there is a pool too. Childrens play area is next to this pool bar. There are 2 main restaurants that serve exactly the same food; Ahima is next to Sunset bar near water villas, Funama is located near arrival jetty. Even though Ahima and Funama serves same food you can only go for one of them depending the room category you are staying. Ahima serves to guests from Jacuzzi Beach Villas and Jacuzzi Water Villas, they do not allow children in this restaurant. Sunset bar is also adults only. 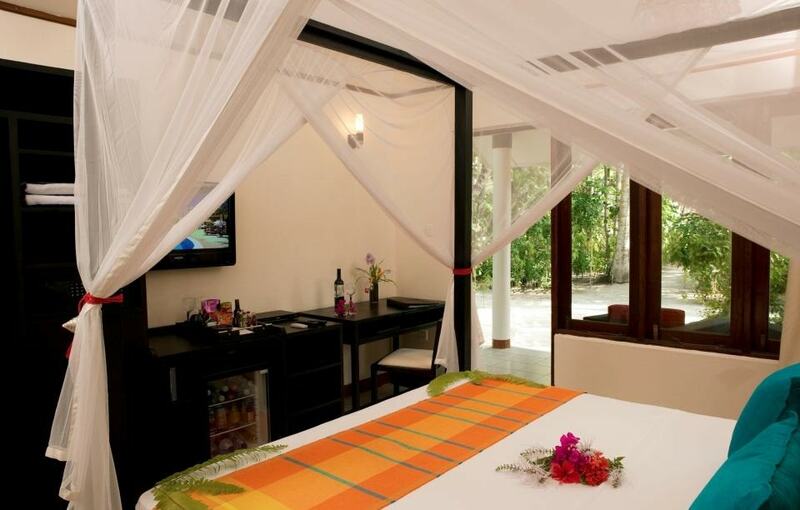 If are staying in normal Beach Villa or Garden Room then you eat your breakfast, Lunch, Dinner Funama Restaurant. 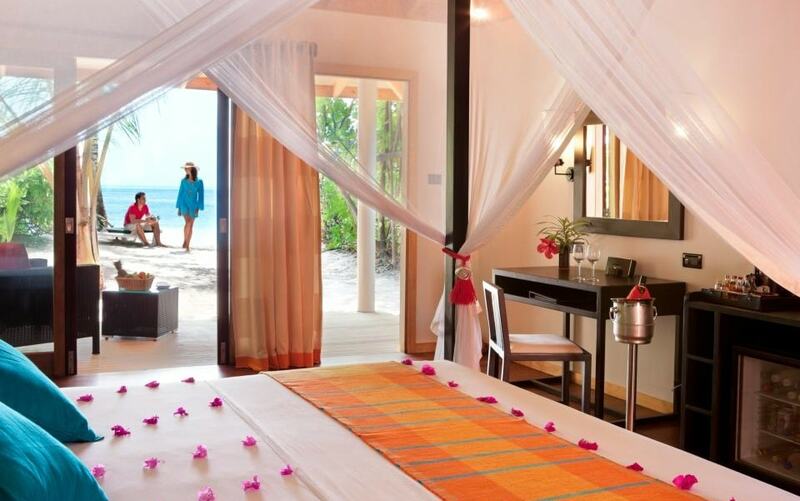 Vilamendhoo is largely an all-inclusive resort even though it is just an option to choose from. The food in both restaurants are "all you can eat" style and varies over the week. There is an a-la-carte restaurant on the eastern side of the island, this overwater restaurant is called Asian Wok. It is good try out once or twice during your stay. Of cause you will go there more often if chefs make you irresistible while your extras budget have room. When you are holiday you should never skip spa, try out at least once. 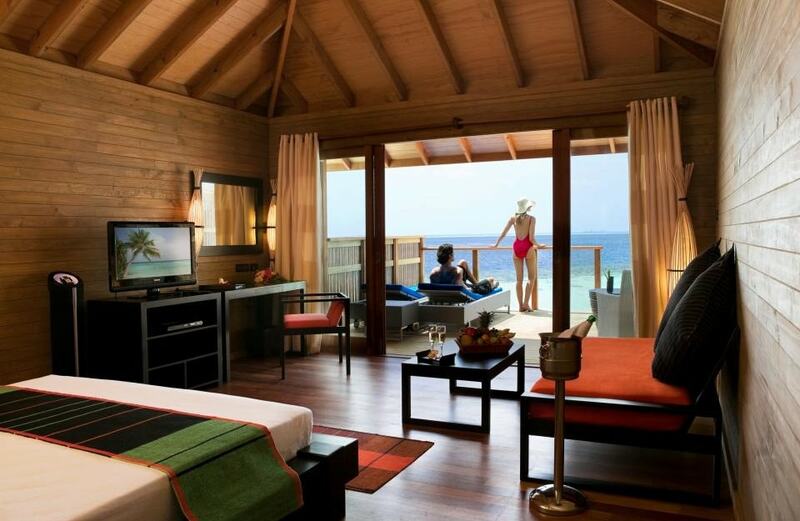 Duniye Spa is located on the water villa jetty. The first building on the water villa jetty is the spa and there are 6 treatment rooms. If you are diver you will need more spa treatments to relax and go with the flow. Needless to mention there is a watersports centre, it is common in Maldives to have one in every resort. In Vilamendhoo there are lot of in-land sports facilities too; football, tennis, badminton, beach volley, table tennis, billiards, snooker, garlendo, darts, mahjong. If you do a lot of snorkeling everyday then there is no practical use of the gym, swimming is a great exercise to your down excess calories, unless you do the lazy of way of staying motionless while current takes you. If you are bored but do not want to go out there is free Wi-Fi in the room to catch up with news and chat friends.